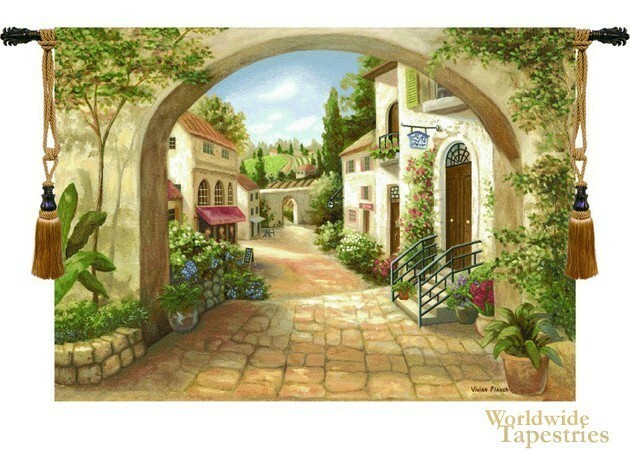 This tapestry “Quaint Town” shows a delightful European village, filled with charm and light. Cobblestones form the pathway which leads the viewer through the archway into the homes an the farmland beyond in the distance. The color palette is cohesive and typically Tuscan filled with golden browns, greens and hints of red. The abundant light in this work uplifts the mood and makes the quaint town glow with happiness. This tapestry “Quaint Town” comes complete with a lining and has a tunnel for easy hanging. Note: tapestry rod and tassels, where pictured, are purchased separately.